Not me, silly! I’m good for now ;) But it sure is baby season around here. How about for you guys? I received two baby shower invites in one day, enough said. 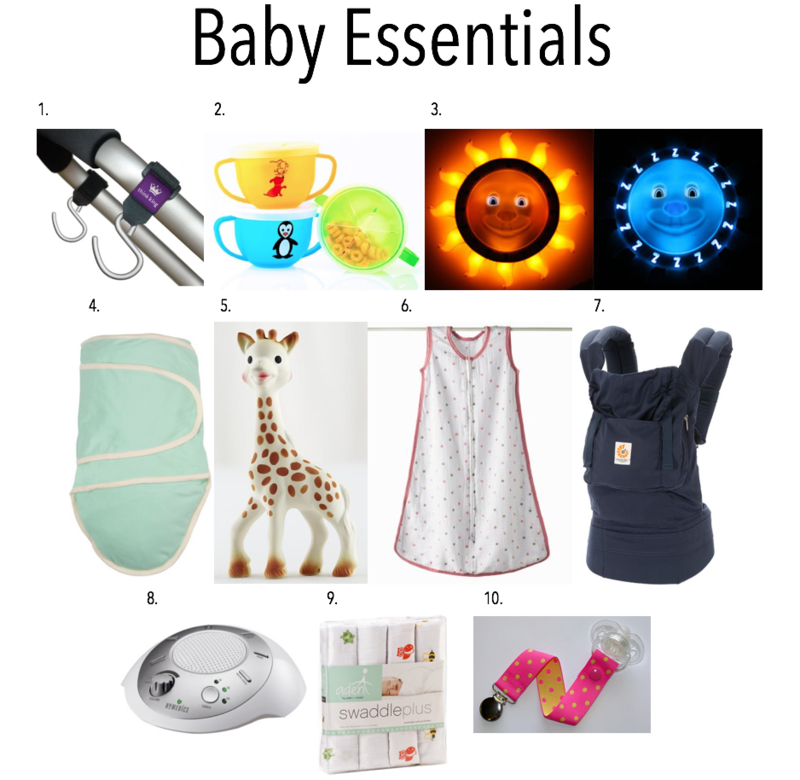 Since I imagine there are a few of you out there that are expecting or have a friend or family member who is, I gathered 10 baby essentials for you. Let me preface, moms will obviously need the basics (diapers, wipes, lotion, baby wash, burp clothes, bottles, strollers, onesies, Dreft, thermometers etc) to begin. Many of these will probably not fall on their list of registered items, but believe me, new moms don’t know everything they’ll need. They’ll thank you later. Heck, many of these items I didn’t know I needed until I had them myself! It takes an army of items just to stay sane on any given day. Stroller hooks. Although more of a necessity for those living in urban areas (you know, when you use your stroller more than your car…sigh…miss those days), these things are key for holding your diaper bag, shopping bags or any other items you don’t have an extra hand for. Snack traps. I swear, children are bottomless pits. As soon as they know how to move their hand to their mouth these things become very handy. Good Nite Lite. This will be helpful once little toddlers make the move into a bed. You set the time you want the sun to come up, signaling it’s morning and time to get up, the goal being to keep children in bed the entire night. I was shocked to say the least, but our son would come running into our room as soon as his sun came up. A piece of sanity (and sleep) saved. Miracle Blanket. I was the swaddling queen for the first 4 months of my kid’s lives. They quickly learn how to wiggle out of most swaddles, hence waking themselves up. This blanket holds the swaddle while they slumber in their little cocoon. Sophie. She doesn’t need much introduction, but she’s a teething savior. Sleep sak. Once my kids were finished being swaddled, I switched them over to sleep saks as opposed to having loose blankets in the crib. Ergo baby carrier. I can’t say I loved this carrier for newborns (they offer an insert), but from approximately 6 months on, this carrier is a dream. It’s comfortable, well designed and never hurt my back. White noise. White noise is definitely an essential to the sleeping habits of my children. I believe it played a key role in why I now have two great sleepers on my hands. Pacifier clip. My son never took a pacifier, but my daughter (who’s the exact opposite in every way) did. This amazing eight inch piece of material is just genius. It keeps the pacifier from falling on the ground or getting lost in the mix of things countless times per day. I feel like I could go on and on, but this list would be a great start to making any mom a very happy, fairly sane, woman. What essentials would be on your list? The Aiden and Anais blankets are my starting place for every shower. I can’t remember if it was you or Brooke who turned me on to them at Mom’s group, but ever since then I’ve been hooked. And we didn’t get the white noise maker until Ciaran was born, but wow….suffice it to say that I tore apart EVERY SINGLE BOX from our move in an effort to find it (it had been stuck in at the last minute in a random box because you KNOW we used it the night before we left!). I hear that Sarah! That’s why I also have the white noise app ;) I’d do anything, haha! Such a good list!! All the items are a necessity. Not sure what I would do w out my stroller hooks! About time you had a little refresher course lady ;) Hope you’re feeling well!